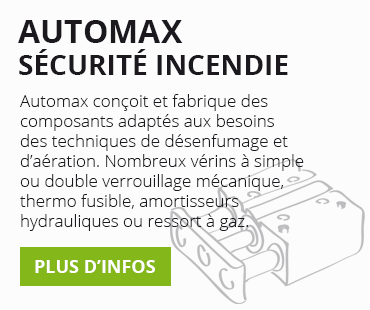 Automax is present in France since 1988. Its headquarters is located in Mont-Près-Chambord in the heart of the Loire Valley. 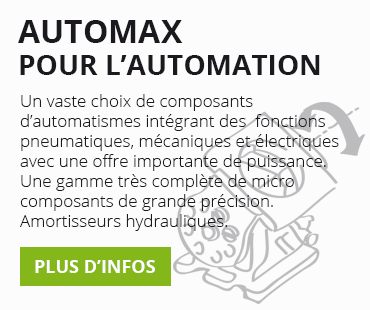 Automax is the world leader in the manufacture of micro pneumatic cylinders with oval pistons.iques à pistons ovales. Automation segment includes automation, the design and production of pneumatic components, electro-pneumatic handling with pneumatic gripper, suction pad with vacuum technology or without contact with the Bernoulli principle. A full range of air ionizers, straps grounded. The fire safety sector designs and manufactures components for specific techniques and smoke ventilation. 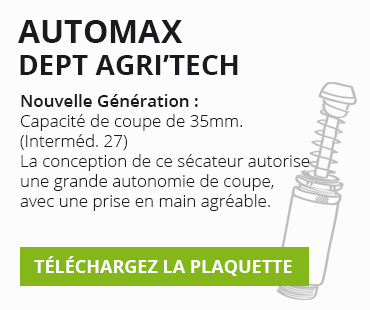 The Agritech sector has an electronic secateurs "Le Bacchus" for the size in viticulture, arboriculture, or olive. Next Generation: New blade profile, quick release & easy. Openings 27 & 35mm. So That a range of accessories to extend the life of your secateurs. Products marked with the chrono Automax Express can be delivered to J +2 subject to acceptable quantities ordered. This free service must be requested when ordering.